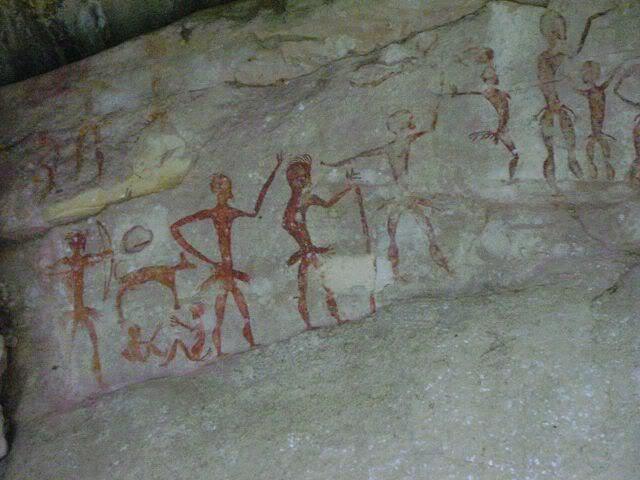 Rock art from the Stone Age, one of the least understood archaeological phenomena in Southeast Asia, have been found in 1938 at Wat Khao Chan Ngam in Amphur Sikhiu, near the National Road 2: These prehistoric paintings are probably from the Paleolithic age. This work of art was created supposedly four to three thousand years ago and is of religious nature. Those partially weather-beaten depictions of people, animals and items of commodity were probably part of a place of worship of the people living here by then. There are depictions of men, women and children in various actions, such as sitting, dancing, standing with a dog, or hunting with arrow with bow. The bodies themselves are clear to see with the calf section distinctively large. The paintings depict scenes, which reflect the way of life by then.